I am a 1980's kid. I was born in the late 1970's and was a kid in the 1980's and a teenager in the 1990's. I don't think I had a whole lot of amazing music growing up, at not like the music of the 1960's. But I had Wham! and George Michael. I loved George Michael! I thought he was gorgeous. I thought his voice was awesome. Faith was the first album I ever had on CD (and the only one I had on CD for a very long time because CDs were very expensive back then) and I had the entire Wham! collection on cassette tape. I was shocked and so sad to hear that George Michael had passed away today. Of all of the deaths this past year, George Michael is the one that has touched me the most (well---next to George Martin) because I truly listened to his music all the time growing up. It was always playing in the background. 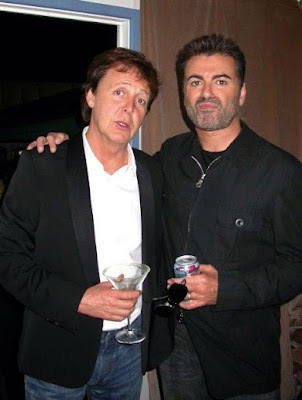 George Michael was a Beatles fan. In 2000 he famously bought John Lennon's "Imagine" piano and then had it go on tour. The piano is the upright piano that John used to write the song "Imagine" and it has a cigarette burn on one of the keys from John. 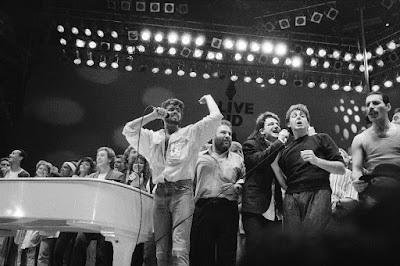 I thought the piano tour was something right out of John and Yoko's peace campaign handbook. The piano was sent to places were there had been violence such as school shootings, murders, etc. And the piano brought a little bit of peace to everywhere it went. People came together and sang "Imagine" or other John Lennon songs around the piano. Photos were taken. Friends laughed. What an amazing way to spread John's message of peace! It was said that George Michael also bought the famous white Imagine piano and has it on loan to the Beatles Story museum in Liverpool. And it is also suspect that he owns various other Beatles items and could have been one of the mysterious British bidders at the high end auctions. 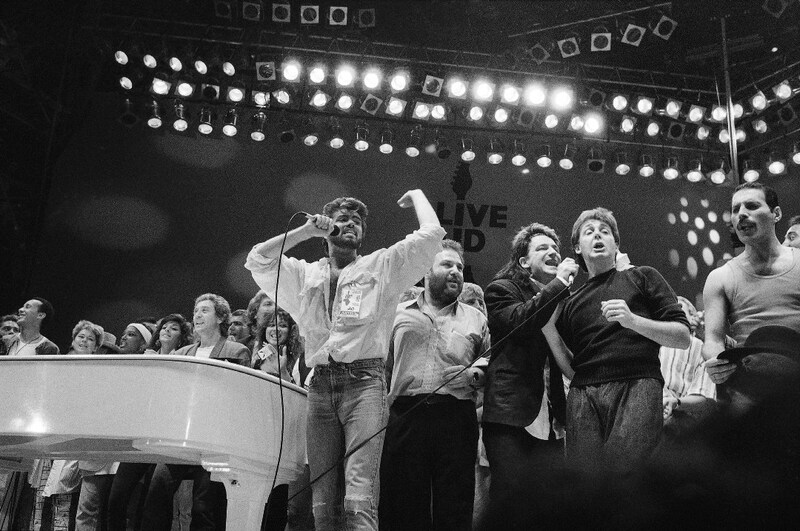 The first time I was aware of George Michael meeting a Beatle was in 1985, when George was on the same stage as Paul McCartney during Live Aid. 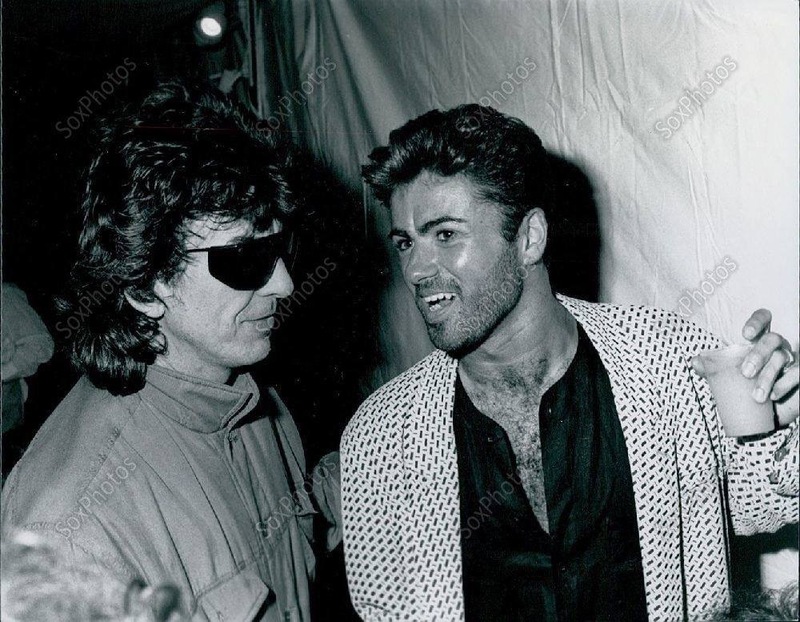 In October 1988, George Harrison attending a party in George Michael's honor for the success of his album, "Faith." 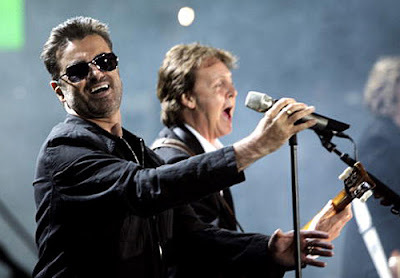 In 2005, George Michael and Paul got together again for Live Aid and they performed a great version of "Drive my Car"
They also recorded a amazing duet of Michael's song "Heal the Pain" a year later. If you haven't ever heard this song, I HIGHLY recommend looking it up on youtube. George was one of the good guys. I too grew up with him as part of the soundtrack of the 80's. So intelligent, seemed like nobody's fool, but too sensitive for these harsh times.